As outlined in the previous chapter, fragments provide a convenient mechanism for creating reusable modules of application functionality consisting of both sections of a user interface and the corresponding behavior. Once created, fragments can be embedded within activities. 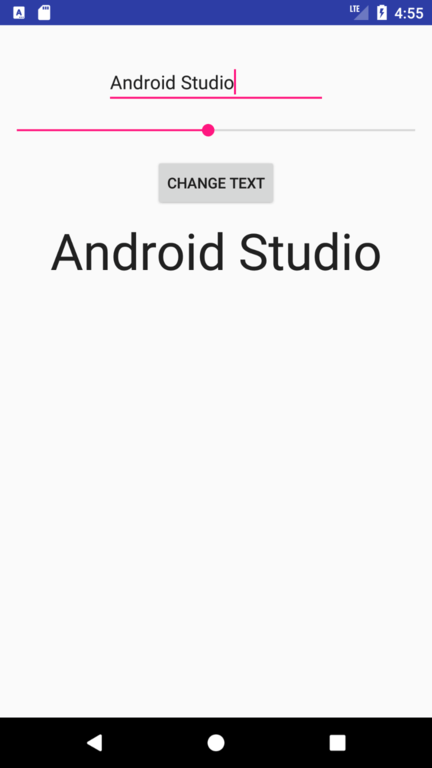 Having explored the overall theory of fragments in the previous chapter, the objective of this chapter is to create an example Android application using Android Studio designed to demonstrate the actual steps involved in both creating and using fragments, and also implementing communication between one fragment and another within an activity. The application created in this chapter will consist of a single activity and two fragments. The user interface for the first fragment will contain a toolbar of sorts consisting of an EditText view, a SeekBar and a Button, all contained within a RelativeLayout view. The second fragment will consist solely of a TextView object, also contained within a RelativeLayout view. The two fragments will be embedded within the main activity of the application and communication implemented such that when the button in the first fragment is pressed, the text entered into the EditText view will appear on the TextView of the second fragment using a font size dictated by the position of the SeekBar in the first fragment. 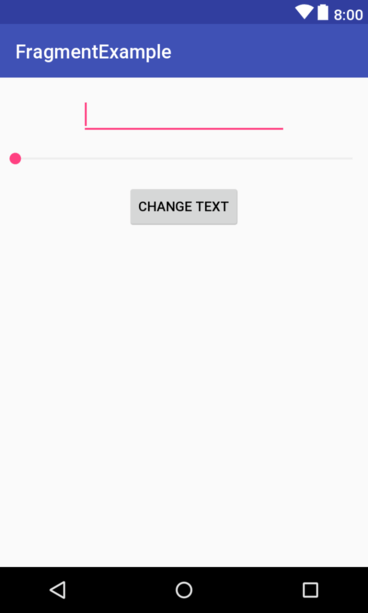 Since this application is intended to work on earlier versions of Android, it will also be necessary to make use of the appropriate Android support library. 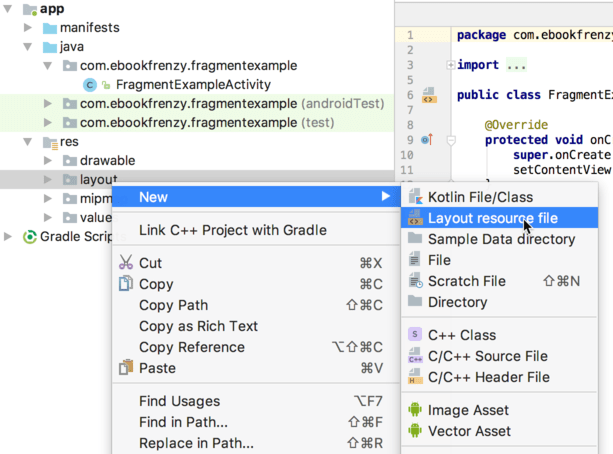 Create a new project in Android Studio with ﻿, entering FragmentExample into the Application name field and ebookfrenzy.com as the Company Domain setting before clicking on the Next button. On the form factors screen, enable the Phone and Tablet option and set the minimum SDK setting to API 26: Android 8.0 (Oreo). Progress through the screens, requesting the creation of an Empty Activity named FragmentExampleActivity with a corresponding layout resource file named activity_fragment_example. Click the Finish button to begin the project creation process. The next step is to create the user interface for the first fragment that will be used within our activity. In the resulting dialog, name the layout toolbar_fragment and change the root element to RelativeLayout before clicking on OK to create the new resource file. Once the changes have been made, switch the Layout Editor tool back to Design mode and click on the warning button in the top right-hand corner of the design area. Select the hardcoded text warning, click the Fix button and assign the string to a resource named change_text. With the layout for the first fragment implemented, the next step is to create a class to go with it. In addition to a user interface layout, a fragment also needs to have a class associated with it to do the actual work behind the scenes. Add a class for this purpose to the project by unfolding the app -> java folder in the Project tool window and right-clicking on the package name given to the project when it was created (in this instance com.ebookfrenzy.fragmentexample). From the resulting menu, select the New -> Java Class﻿ option. In the resulting Create New Class dialog, name the class ToolbarFragment﻿ and click on OK to create the new class. Later in this chapter, more functionality will be added to this class. Before that, however, we need to create the second fragment. Once the XML changes have been made, switch back to Design mode and extract the string to a resource named fragment_two. Upon completion of these steps, the user interface layout for this second fragment should resemble that of Figure 30-3. As with the first fragment, this one will also need to have a class associated with it. Right-click on app -> java -> com.ebookfrenzy.fragmentexample in the Project tool window. From the resulting menu, select the New -> Java Class﻿ option. Name the fragment TextFragment﻿ and click OK to create the class. Now that the basic structure of the two fragments has been implemented, they are ready to be embedded in the application’s main activity. The main activity for the application has associated with it an XML layout file named activity_fragment_example.xml. For the purposes of this example, the fragments will be added to the activity using the <fragment> element within this file. Using the Project tool window, navigate to the app -> res -> layout section of the FragmentExample project and double-click on the activity_fragment_example.xml file to load it into the Android Studio Layout Editor tool. 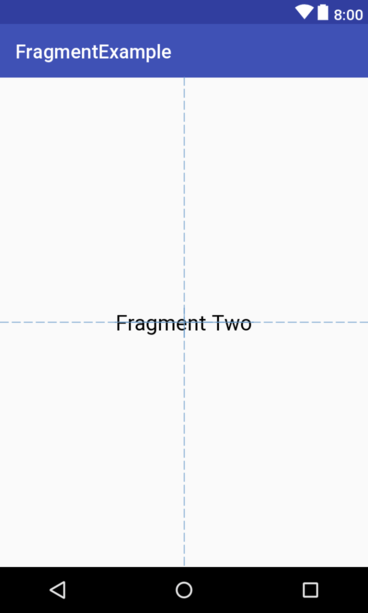 Click and drag another <fragment> entry from the panel and position it so that it is centered horizontally and located beneath the bottom edge of the first fragment. When prompted, select the TextFragment entry from the fragment dialog before clicking on the OK button. When the rendering message appears, click on the Use @layout/text_fragment option. Use the Infer Constraints button to establish any missing layout constraints. Before proceeding to the next step, select the TextFragment instance in the layout and, within the Attributes tool window, change the ID of the fragment to text_fragment. When the user touches the button in the toolbar fragment, the fragment class is going to need to get the text from the EditText view and the current value of the SeekBar and send them to the text fragment. As outlined in An Introduction to Android Fragments, fragments should not communicate with each other directly, instead using the activity in which they are embedded as an intermediary. Before moving on, we need to take some time to explain the above code changes. First, the class is declared as implementing the OnSeekBarChangeListener interface. This is because the user interface contains a SeekBar instance and the fragment needs to receive notifications when the user slides the bar to change the font size. Implementation of the OnSeekBarChangeListener﻿ interface requires that the onProgressChanged(), onStartTrackingTouch() and onStopTrackingTouch() methods be implemented. These methods have been implemented but only the onProgressChanged() method is actually required to perform a task, in this case storing the new value in a variable named seekvalue which has been declared at the start of the class. Also declared is a variable in which to store a reference to the EditText object. The onCreateView() method has been modified to obtain references to the EditText, SeekBar and Button views in the layout. Once a reference to the button has been obtained it is used to set up an onClickListener on the button which is configured to call a method named buttonClicked() when a click event is detected. This method is also then implemented, though at this point it does not do anything. The above implementation will result in a method named onButtonClick() belonging to the activity class being called when the button is clicked by the user. All that remains, therefore, is to declare that the activity class implements the newly created ToolbarListener interface and to implement the onButtonClick() method. With the code changes as they currently stand, the toolbar fragment will detect when the button is clicked by the user and call a method on the activity passing through the content of the EditText field and the current setting of the SeekBar view. It is now the job of the activity to communicate with the Text Fragment and to pass along these values so that the fragment can update the TextView object accordingly. The goal of this chapter was to work through the creation of an example project intended specifically to demonstrate the steps involved in using fragments within an Android application. Topics covered included the use of the Android Support Library for compatibility with Android versions predating the introduction of fragments, the inclusion of fragments within an activity layout and the implementation of inter-fragment communication. This page was last modified on 11 January 2019, at 16:21.